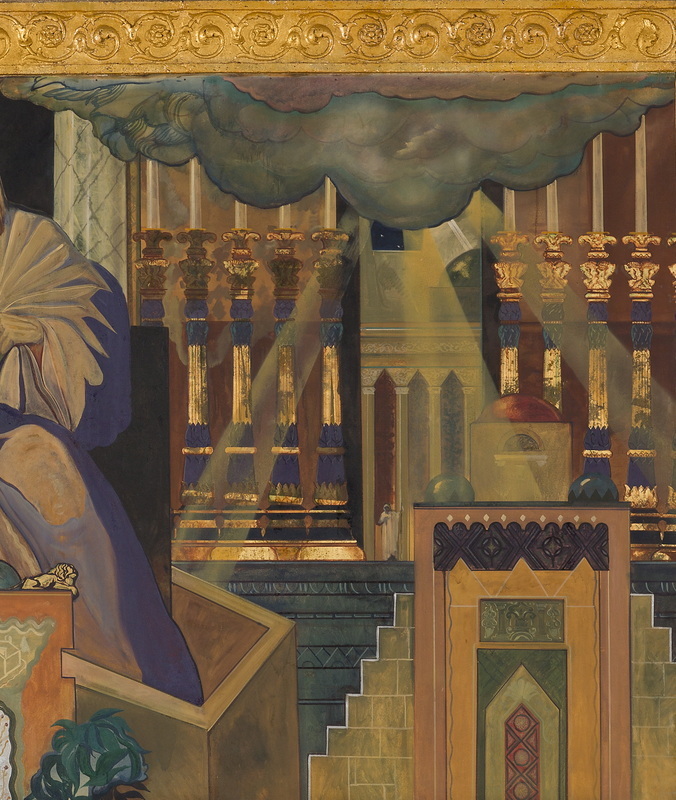 Mural Description From the Lectures of Rabbi Edgar F. Magnin, 1929-1930: "On the right of David is a suggestion of the Temple of Solomon with the ten golden candlesticks that were within, in accordance to the verses in the Book of Kings (Kings 7: 48-49). One also see two shafts of light coming forth from the cloud, symbolizing the Shehina or presence of God descending upon the shrine." Read in Primary Text: Understanding Jewish History 1, Sol Scharfstein, Ktav, 1996, " Solomon, King of Peace", pages 34-35. King David's son, Solomon created a rich legacy as a wise leader and prosperous King, and as the builder of the First Temple in Jerusalem. In Solomon's time, the Kingdom of Israel was at the crossroads of all the major trade routes; effective rulers strengthened their Kingdoms through aggressive trade and alliances with other rulers. To build a Temple in ancient times, and modern times, requires extraordinary vision, many different skills and access to resources and labor. What does the Biblical text tell us about ancient building practice and trade in the Ancient near east? In what ways is Solomon's Temple different and similar to the Temples we gather in today? What did the text tell you about the life of the community, the leadership of Solomon, and his relations with neighboring tribes? In order to create an economically secure and peaceful territory for his people, amidst warring tribes, Solomon created alliances with other Kings and nations, to work together towards common goals. Solomon understood the importance of trading with other nations, in order to secure his Kingdom. Sea trade in the Mediterranean area had been growing peacefully as leaders realized what could be gained. Sea trade during this time was strengthened by the Phoenicians introducing a new flat bottomed ship, that could hold a great deal of cargo and increase the amount of goods that could be traded. The second innovation which increased trade was the introduction and training of camels. Called "the ship of the desert," the camel could travel for fourteen days without food or water. In Solomon's time, the Kingdom of Israel was at the crossroads of all the major trade routes linking Assyria, Egypt and the Mediterranean. Israel became a powerful partner in trade with the business skill of King Solomon, who "excelled all the Kings of the earth in riches and in wisdom" (1Kings 10:23). ACTIVITY #1 How Do You Build a Temple in 950 B.C.E? To strengthen his Kingdom through trade, Solomon created a partnership with the Phoenician King Hiram of Tyre, now in Southern Lebanon. Hiram was the same royal house that assisted his father David in building his own palace. As part of this alliance, a fleet of Phoenician flat bottomed boats were built at Solomon's main southern port at Ezion-geber, today's Elat. Soon large fleets of the these ships traveled on the Gulf of Aqaba to the east coast of Africa, where Solomon had discovered gold. The books of Kings claims that in just one year Solomon received 666 talents, which is roughly 50,000 pounds of gold! (1 Kings 10:14). But Solomon had troubles crewing the ships as the Israelites have little experience on the water! Fortunately, King Hiram sent his sailors with the fleet of ships he built for King Solomon. As new wealth streamed into the capital, the royal court grew and Solomon increasingly focused his attention on his construction projects. He began building the sacred Temple, which his father dreamed of, to replace the tabernacle--(the tent-like shrine where David placed the Ark), and provide a majestic, sacred home the Ark of the Covenant. The Temple took seven years to complete. It was built of stone and cedar, carved within and overlaid with pure gold. When it was done, Solomon dedicated the Temple in a public ceremony of prayers and sacrifices. In this activity students will closely read a section of the Biblical text (attached below) describing the building of the Temple. Divide class into eight groups. Print out the text below. Assign each group one of the sections of the text. Some chapters are divided into multiple sections. As they read together they will note and draw the following elements of the construction process on the "Temple Construction Planning" page. ARCHITECTURE: What was the architectural design for the Temple? How was it put together? What were the dimensions of the different areas? There are eight separate sections of text to read about the building of the Temple. Click the blue sections below to download; print out the text for the students to read. Was the language and terminology of the text difficult to read? Did it get easier as they became more familiar with it? What was surprising about the descriptions of the materials and building process? Were you able to visualize the time period and the construction? What did the text tell you about the life of the community and the leadership of Solomon? How did you understand the relationship and connections between the different nations and Kingdoms at this time? ACTIVITY #2 How Big is a Cubit? 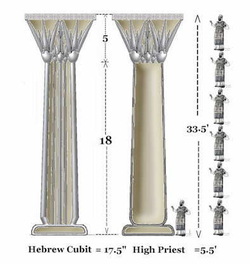 In order to understand the sizes of the building, refer to this text in 1 Kings 6: 2, "And the house which king Solomon built for the Lord, the length thereof (was) sixty cubits, and the breadth thereof twenty cubits, and the height thereof thirty cubits." Take colored chalk and go to an outside area where you can mark an area with the chalk to outline an area the size described in the cubits in the text. Work as a group to measure the 60 x 20 x 30 cubits using the measurement of the students arms from elbow to extended middle finger. As they are children it will be smaller; or assign the biggest student to be the measuring stick! Why do they think measurements were done in terms of the human body (for example, there is also reference to the "handbreadth or tephach in Hebrew, in 1 Kings 7: 26. Was the actual size of the space of the Temple you measured larger or smaller than you imagined? On an empty wall, (or floor) roll out poster paper, or tape together large sheets, to create a very large "Architect's Wall Plan." Have large post-its on hand and thin colored markers. Use a marker to draw two lines to divide it horizontally into three layers; write (bottom to top) : Materials, Objects, Assembling the Temple. Using their "Temple Construction Guide" Graphic Organizer as a guide, students should take turns filling in each layer with words, descriptions, quotes from the text and illustrations culled from their text reading. Each layer should fill with all their collective words and images describing all that went into building the Temple. The top layer can include different sketches created by the students of how they visualize the Temple. Students can draw directly on the Wall Plan and/or they can write on large post-its and let them collectively accumulate to form a compete picture. When complete, ask the students to take a few minutes to look over the whole Wall Plan to see the big picture. NOTE: The Architect's Plan can also be created using digital tools if available. How do these artistic interpretations compare with what they visualized? What questions do they have about the design and construction of the Temple? What more would they like to know. If time allows, have the class spend some time doing additional research on-line to explore their questions.